From a personal perspective, we all can attest to the fact that third platform and related technologies such as cloud, mobility and social business have changed how we work on a daily basis. However, technologies such as artificial intelligence (AI), data analytics, robotics, augmented and virtual reality and intelligent process automation (including robotic process automation or RPA) are rapidly changing who – or what – is doing the work. The World Economic Forum calls this the “fourth industrial revolution” and its impact will be felt broadly across all industries and many job functions. These changes will also happen very rapidly – in fact, many of us are already seeing the growing role of “digital workers” in our own companies and industries. Hence our title – the future is now. IDC developed the Future of Work framework to help organizations frame Future of Work strategies and scope Future of Work initiatives. It is also intended to help scope the technologies and related services required in the modern workplace. The Future of Work framework takes a holistic integrated approach, encompassing three interrelated and interconnected pillars (see Figure below). As we noted above, technologies like AI, robotics, intelligent process automation and AR/VR are automating and augmenting the tasks and processes traditionally accomplished by human workers. In some cases, these technologies can even perform tasks that humans were unable to perform. The workforce pillar of the IDC Future of Work framework is about enabling and empowering this new digital worker and embracing opportunities for human-machine collaboration. These opportunities encompass both information work and operational work and can apply to both knowledge/information workers and front-line workers. To fully leverage the opportunity of automation, augmentation and human-machine collaboration, organizations must have the relevant and required human skill sets. In some cases, these skill sets may exist internally, and/or they may be developed in current employees via training, development and reskilling programs. Organizations will also look externally to find the skill sets required. Some of these requirements may be short term, and we expect organizations to increasingly take a task-based approach, matching specific tasks to specific resources. They may adopt new methods for skill acquisition, such as skill marketplaces or crowdsourcing. In the near term at least, the markets for new skillsets are competitive, driving an increased focus on worker retention. A multi-generational workforce means that companies need to support multiple workstyles. They need to preserve existing knowledge even as they bring in new capabilities. 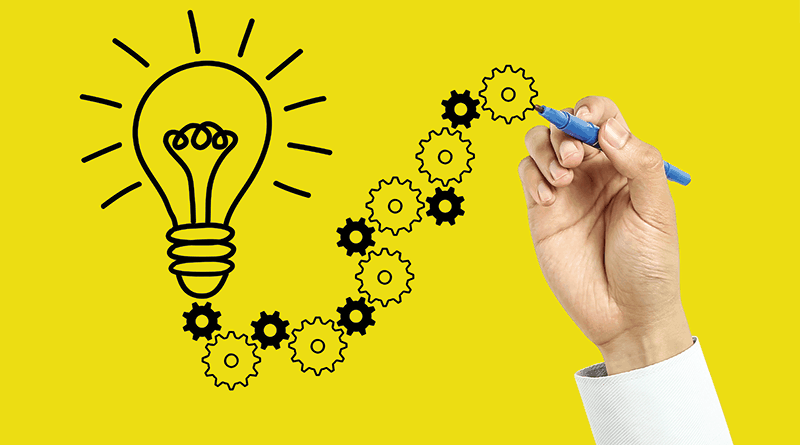 New skillsets, new sources of talent, new styles of work may require new performance metrics. All of this leads to a strategic focus on worker experience. This is all encompassed in the work culture pillar of the Future of Work framework. The work environment must adapt to support the new workforce and new work culture. The environment itself must be intelligent and agile, connected and secure, independent of a physical place or specific time of day. The workspace must enable access to corporate resources and support collaboration to allow all workers to effectively contribute, whether they are full time or part time, local or remote, permanent or temporary and whether they are human or machine. 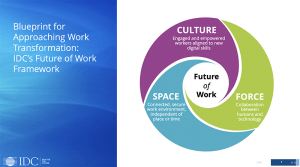 This is the workspace pillar of the IDC Future of Work framework. In addition to being agile, secure and available 24/7, the modern workspace also augments the capabilities of human workers with intelligent endpoint technologies, digital assistants, smart conference rooms, etc. The modern work culture and the modern workspace further enable human-machine collaboration – hence the cyclical nature of our framework. Organizations must take a structured and holistic approach to work transformation and Future of Work initiatives. The Future of Work is not just about automation and job replacement, or millennials entering the workforce or the latest digital workspace solution. The Future of Work is an enterprise wide imperative. It requires CxO leadership and intimate collaboration between IT, Line of Business, HR and other departments, and results in increased productivity, worker engagement and competitive differentiation. Most importantly, Future of Work initiatives must be an integral component of an organization’s overall digital transformation (DX) strategy. Holly Muscolino is the Research Vice President, Content and Process Strategies and the Future of Work, IDC, responsible for research related to innovation and transformation in content and process solutions, including intelligent process automation and content workflow services.